Though his first West Coast rally was disrupted by Black Lives Matter activists, Democratic presidential hopeful Bernie Sanders attracted record crowds in Seattle and Portland. Sanders is scheduled to speak in Los Angeles on Monday. On Sunday, some 28,000 supporters showed up at the Moda Center, an NBA arena used by the Portland Trail Blazers. An estimated 8,000 were left standing outside when the hall filled to capacity. 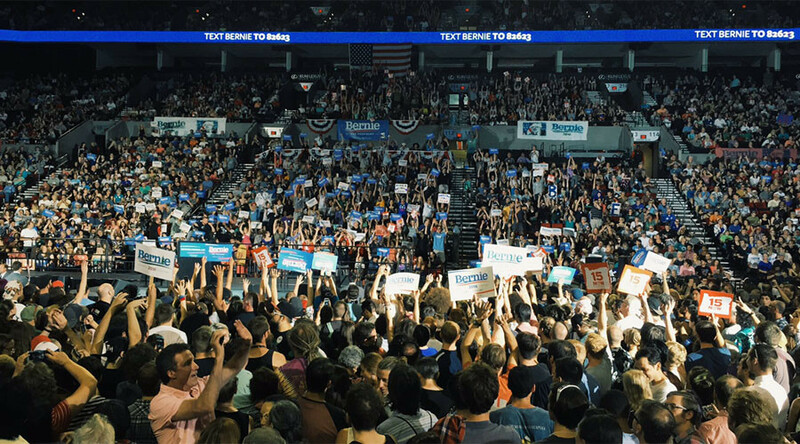 The evening before, Sanders filled a Seattle pavilion with a crowd estimated at 15,000 to deliver an hour-long speech about reclaiming the US from billionaires. By contrast, the biggest draw by Hillary Clinton, widely considered the front-runner for the Democratic Party’s nomination, amounted to 5500 people at the New York campaign kick-off in June. The West Coast tour did not start well for the Vermont senator, however. Earlier on Saturday, activists from the Black Lives Matter movement stormed the stage and interrupted Sanders, who eventually left without addressing the some 5,000 people at Seattle’s Westlake Park. Sanders was due to address the assembled crowd to celebrate the 80th anniversary of Social Security and the 50th anniversary of Medicare, social programs that he has vowed to support and expand. Among the speakers at the event were Congressman Adam Smith (D-Washington) and Seattle council member Kshama Sawant. “If you do not listen … your event will be shut down,” one of the activists told the organizers as they took over the stage when it was Sanders’ turn to speak, according to the Seattle Times. Johnson and her two colleagues stayed on stage for nearly half an hour, after which Sanders left without delivering his remarks. In a statement issued after the event, Sanders said he was “disappointed that two people disrupted a rally attended by thousands” and noted that “no other candidate for president” was as committed to criminal justice reform and fighting racism. This was not the first time Black Lives Matter activists have disrupted a Sanders speech. At the NetRoots Nation conference in July, both Sanders and another contender, former Baltimore mayor Martin O’Malley, were shouted down by protesters. “If you don’t want me to be here, that’s OK. I don’t want to outscream people,” Sanders said on that occasion. The fact that no Clinton event has ever been disrupted by activists has fueled speculation on social media that Saturday’s incident, and maybe even the NetRoots before it, could have been an operation mounted by the party’s front-runner to discredit her rivals. According to one Seattle activist, however, Sanders was simply an easier target. “The amount of security that [Clinton] has at her events makes her much less accessible,”wrote Ijeoma Oluo. She echoed the activists’ claim at the rally that Seattle prioritized “the comfort of middle-class white liberals over justice for people of color,” and brushed off concerns that Black Lives Matter should be targeting conservatives instead. While making it abundantly clear that she supported their goals, Jayapal asked the activists to act constructively. “We have to take our anger and rage and channel it into building, growing, loving, holding each other up,” she wrote. For his part, Sanders says his civil rights record is unimpeachable. He marched with Dr. Martin Luther King Jr. in Washington in 1963, and endorsed Jesse Jackson’s presidential run in 1988. He is campaigning on a slate of progressive policies including a $15 federal minimum wage, closing the “pay gap” for women, and introducing 12 weeks of paid maternity leave for new parents.